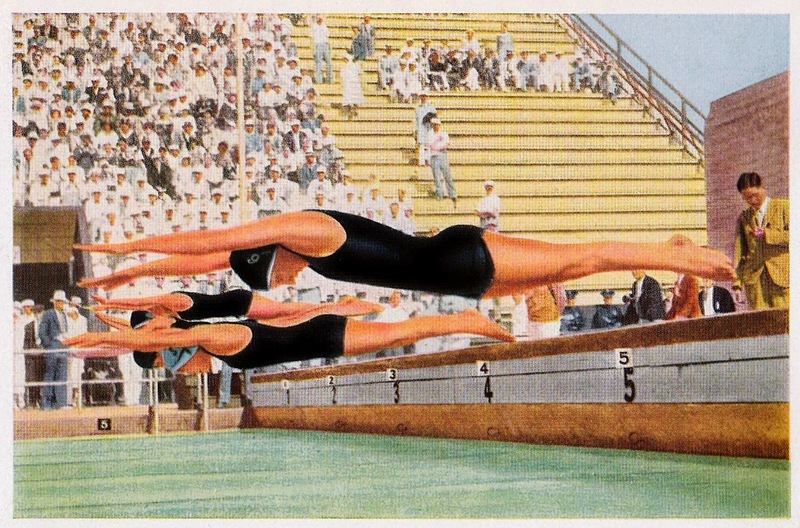 This week's Friday Vintage Freebie uses an image from an old German book about the 1932 Olympic games in Los Angeles. With the winter Olympics going on right now in Sochi, I thought it might be appropriate to post something with an Olympic theme. Since I don't have anything from the Winter Olympics, this one will have to do and given I'm more than ready for summer right now, that's fine by me. The 1932 Olympics had some interesting facts attached to them. Los Angeles was the one and only city to put in a bid to have them. The world wide depression was going on at this time and apparently, no one else wanted to pay to host them. Less than half the athletes who competed in the 1928 Olympic games in Amsterdam returned to compete in Los Angeles; their countries couldn't afford to send them. Even America's own president, Herbert Hoover, did not attend. Also, the victory podium was used for the first time at this Olympiad. I've used this image (but flipped) on this card here. Please note these images are for your personal use only. If you use the images and post your project on the internet, please link back to me. I'd love to see your creations! I hope you'll email me a photo of your work or post a link to it in the comment section of this post. Just right click on the image and save it to your computer.